Are you looking for heating services in North NJ? 1st Choice Plumbing, Heating & Drain Service, is a fully licensed, insured and bonded plumbing and heating company providing expert heating services in North NJ. Our heating technicians are highly experienced in performing heating system installation in North NJ and heating system repair in North NJ for heaters of a wide array of makes and models. If your heater malfunctions or completely breaks down, our heating services in North NJ offer a wide array of solutions that can provide you with the warmth you need during even the coldest of winter months. 1st Choice Plumbing, Heating & Drain Service’s professional heating technicians can provide your home or office with efficient heating services in North NJ no matter how complex your heating problem may be. When our heating professionals arrive at your location, we will determine the right solution for your heater’s condition. 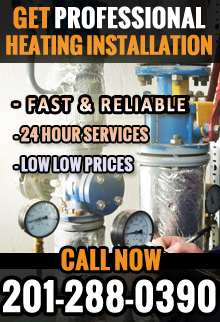 In addition to heating repair in North NJ, we also specialize in boiler repair in North NJ, baseboard heating repair in North NJ and furnace repair in North NJ. If you need a heating system installation in North NJ, we carry leading boiler brands including Utica, Weil-McLain, Peerless and Crown, as well as leading furnace brands including Lennox, American Standard, Carrier and Goodman. At 1st Choice Plumbing, Heating & Drain Service, we offer heating financing in North NJ for affordable heating services. With our Home Climate Card™ Credit Card Program, you can have a heating repair geo or heating installation geo performed with no down payment and no annual fee. You can also gain credit for future repairs. Our heating professionals provide heating services in North NJ 24 hours a day, 7 days a week for your heating emergency. For more information on our heating services in North NJ, call 1st Choice Plumbing, Heating & Drain Service today at (201)288-0390! 1st Choice Plumbing, Heating & Drain Service – Your trusted company for heating services in North NJ.